Large, well-appointed home that has been meticulously maintained! As you tour each lovingly decorated room, admire the upgrades that make this home a standout! Gourmet kitchen with maple cabinets, double oven, corian counters and stainless appliances, morning room with stunning chandelier, dryclean system in the laundry area, expanded 1st floor master suite, master bath with tile shower and tub, and tinted windows to protect furniture and flooring while still keeping the home feeling bright and open. The list continues as you work your way to the second floor! Huge bonus room that can be used as a second master suite with full bathroom, three additional bedrooms with full bath to share, specialty ceiling fans in each room, and a lovely walkway. The entire home is also wired for sound! Plantation shutters, custom shades and blinds all convey with the home. Outside you will enjoy the maintenance free decking and fenced in yard. 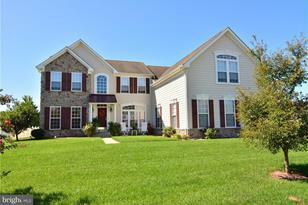 Great space, beautiful home - priced to sell! Driving Directions: From Central Ave, turn into the community of Lord Baltimore. Continue straight, house is on corner with large flagpole in yard. 37138 Lord Baltimore Lane, Ocean View, DE 19970 (MLS# 1001568522) is a Single Family property that was sold at $467,500 on July 27, 2018. Want to learn more about 37138 Lord Baltimore Lane? Do you have questions about finding other Single Family real estate for sale in Ocean View? You can browse all Ocean View real estate or contact a Coldwell Banker agent to request more information.